Rediff.com » Movies » Like the Bombay Velvet trailer? VOTE! 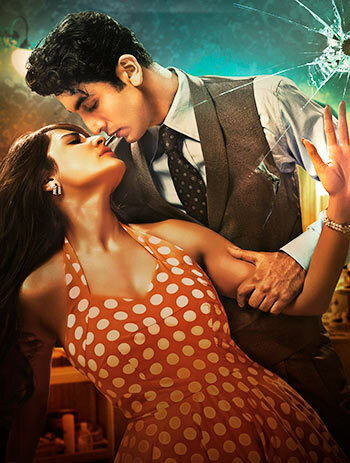 The first trailer for Bombay Velvet brings with it an overwhelming feeling of deja view, says Raja Sen. The first trailer for Bombay Velvet -- Anurag Kashyap’s biggest budget opus, a jazz-soaked 1960’s ode to crime in Mumbai -- is here, and despite all the stylish bells and whistles, the overwhelming feeling is one of deja view: been there seen that, many times over. As we see the journey of steel-cage fighting achiever Johnny Balraj riding up the ranks to become a 'bigshot' in Bombay, there are constant echoes to movies of the past: from Scarface to Deewar, from old Hollywood to those moronic Once Upon A Time In Mumbaai movies, Bombay Velvet -- from this peek -- looks to be a wall-to-wall compilation of (well-shot) cliche. Which is why I suspect -- or, honestly, hope -- that this first trailer is pure misdirection, that Kashyap is lulling us in, making us imagine we know exactly what to expect: and then pull the rug out from under our complacent feet. That he has all the tropes in place but the film will subvert them. Well, here’s to that -- and not something so obviously, garishly masala as presented here. Ranbir Kapoor’s hardboiling the old-school accent with much commitment (‘He’s Johnny Balraj, see?’) a moustached Karan Johar looks fascinating as the bad guy, Khambatta, and quizmaster Siddharth Basu shows up mouthing cryptic clues. Just not cryptic enough, at this stage. Right now the trailer sets us up for much retro kitsch -- will Kashyap, for the first time ever, deliver what we expect? Or throw our expectations in our faces? Bombay Velvet hits cinemas May 15. So what do you think of the trailer? VOTE NOW! Akshay, Devgn, Ranbir: What are Bollywood's BIGGEST stars working on? VOTE: Should Bhagavad Gita be taught in schools?